"I have never worked for a person as hard working and devoted to his clients and employees as I have for the past five years working for David Winterton. He goes above and beyond to help his clients." When you contact the law office of David J. Winterton & Associates, the first person you will speak with will be Julie. She takes a personal interest in and enjoys interacting with new and current clients. Julie has been with our firm for over seven years, which speaks volumes to her level of commitment to our firm and our clients. 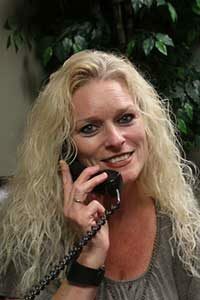 In fact, she has said that she has never enjoyed her work as much as she does here at David J. Winterton & Associates. Not only is she great in her interactions with each client, she also has expertise in handling various tasks necessary to help facilitate our cases to keep costs down. She is a very personable and hard worker. Julie is always happy to help our clients in any way she can. It is no wonder that we are so pleased to have her on our team. Once you meet her you will agree. After having lived in California and Oregon, Julie found that she loves the desert sun here in Las Vegas. When she is not greeting our clients, she enjoys going to the pool, playing at the park with her kids, taking long walks, and just spending time with her family.